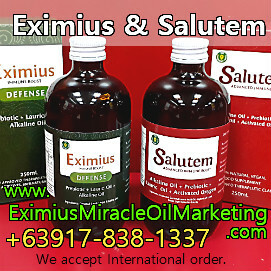 Here's a satisfied Eximius Oil user. He has sinus. 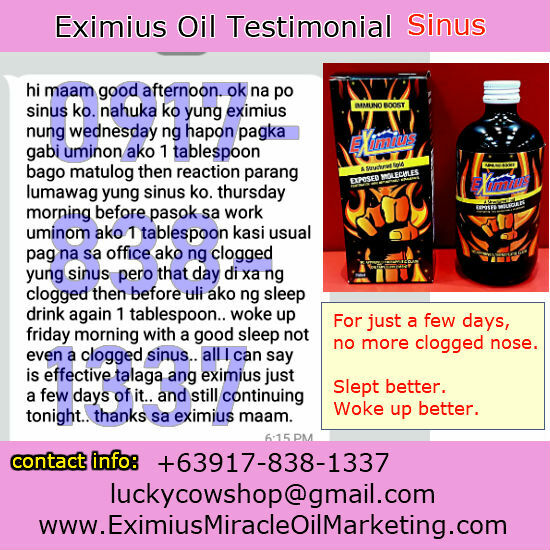 Within a day, he already felt the benefit of Eximius Oil to help him from his sinus. Here's a text message he sent (translated to English). User: Hi maam good afternoon. I'm okay now, regarding my sinus. I got the Eximius on Wednesday afternoon. On that night, I took 1 teaspoon before I slept. Reaction is my sinus is loosen. Thursday morning before going to work, I took 1 teaspoon, because if I'm at work, my nose are clogged. But that day, my days didn't clog. That night I took 1 teaspoon again. I woke up Friday morning with a good sleep not even a clogged nose. All I can say is Eximius Oil is really effective even within few days. And still continuing tonight. Thanks for the Eximius maam.